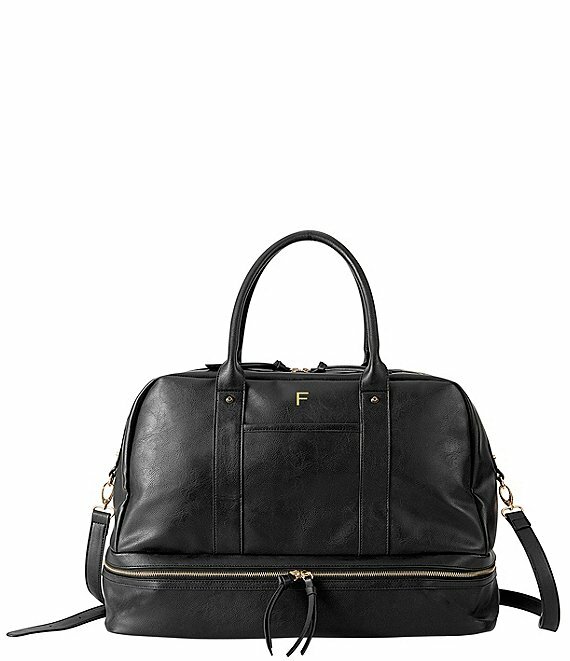 The Black Vegan Leather Luggage duffle is crafted out of sturdy vegan leather and features two separate zippered compartments. With both interior and exterior pockets, this bag has plenty of storage for all the necessities plus any extras. Take this chic tote on your next trip and travel in style. Dimensions L: Luggage Tote: 20.25"; Handle Drop: 8"; Outside Pocket: 6.5"; Inside Zippered Pocket: 5"; Bottom Compartment: 20.25"; Adjustable Strap: 57"; W: Luggage Tote: 8"; Outside Pocket: 5.75"; Inside Zippered Pocket: 7.75"; Bottom Compartment: 8"; Adjustable Strap: 1"; H: Luggage Tote: 12.5"; Bottom Compartment: 4"